I knew today would be too hectic to get to the studio, so I decided to do some prep work on my self-portrait using the computer. 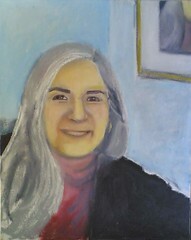 I took the photo of the portrait as it looked on day 4 (posted yesterday) and opened the image in Painter IX. I copied the portrait and then drew over the digital copy of it using Painter's digital pastel. I wanted to work on the eyes, trying to get the expression I wanted. I also need make adjustments to get the nose into the right perspective for a three-quarter view, and wanted to sketch the changes digitally ahead of time before tackling the problem in oil bars. Although I am not entirely happy with the result here, I am glad I did this exercise. After changing the eye shape and position several times, I discovered that one of the problems was an out of place eyebrow. So that is good. I had less trouble with the nose. I ended up making so many changes that in the end it was confusing, but I did get closer to the expression I am looking for. In any case, it was a good exercise in looking, and that always helps, even if the payoff is not immediate. Tomorrow should be less crazy, and I plan to get up to the studio to work on the actual portrait with actual paint. To be continued. . . .